I've had Twenty Boy Summer by Sarah Ockler on my shelves unread for years. That's right, years. I'd heard such good things about it, which is why I bought it, but I put off reading it for so long and now that I have read it, I cannot remember a single reason for the delay. I knew the rough storyline of the book beforehand - two best friends, Anna and Frankie, are on holiday in California one summer and make this plan to meet a boy a day and have this beautiful summer romance. Except there's something Anna has never told Frankie - that she has had a summer romance, the previous summer with Frankie's brother and Anna's other best friend, Matt. Matt wanted to be the one to tell Frankie, only before he could do so, Matt died. Now it's a year later and everything has changed. Frankie and Anna are still friends, of course, but Frankie is dealing with the death of her brother and the ways in which her parents are not dealing. She's changed for a shy, nice girl into someone who goes after what she wants and is interested in boys and her appearance more. And Anna is quietly suffering the loss of her best friend and the boy she'd been in love with ever since she could remember. It's hard keeping such a huge thing secret from Frankie, but she feels as though it was something that Matt would have wanted her to do. I think when I originally heard about Twenty Boy Summer, I really just thought it would be this cute, light-hearted contemporary romance without much depth to it. And then with the element of loss that plays into the story right from the beginning, I began to worry that this book would feel heavy and weighed down with the death of Matt. But wonderfully, Twenty Boy Summer fits nicely between the two. Yes, there is a very cute summery romance that happens, but alongside that are two best friends grieving and coming to terms and moving on with Matt's absence as well as managing their friendship and how they've let Matt's death change them over the past year. 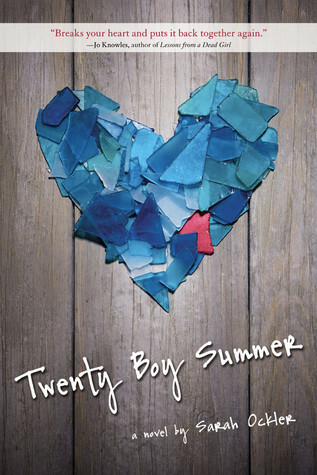 The thing with Twenty Boy Summer is that I kind of built up in my head what it would be like when Frankie finally learns about Anna and Matt. It's this huge betrayal and you wonder how two people can be best friends and still keep this massive secret from each other. So in my head, this confrontation is explosive and earth-shattering and there is a bit of that in this book, but it's still a lot more gentle than I was imagining. I think a lot of the emotion of the story I felt more in the first half of the book than I did in the second half, which is surprising and a teensy bit disappointing. Still, I'm really glad that I finally read Sarah Ockler's debut book! I have others by her on my shelf and I am very much looking forward to the stories that she will tell. Thanks! I'm glad to hear it, I really liked this one! I'm glad you enjoyed this even after not reading it for years! I can relate - there are tons of books I own that I have yet to read! I wasn't expecting there to be as much depth to this as there was either. I really enjoyed it though and I have no idea why I don't have her other novels yet! I have Fixing Delilah to read soon and I'm really looking forward to it!